Carrier oils are a very important ingredient when making your own skin care or using essential oils. Because essential oils are concentrated they need something to dilute them so they can be applied to your skin with out any irritation. Applying most essential oils full strength can irritate and sometimes burn skin. They are exactly what they are called. They are natural oils that are used to dilute and "carry" essential oils so they can be used on the skin. Think of them as a base for your skin care. These oils are vegetable oils or fixed oils. They do not evaporate like some essential oils, but unlike essential oils they do go rancid and need to be stored properly. These oils are made by pressing the fatty parts of plants such as nuts, kernels and seeds. 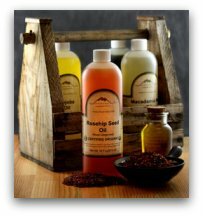 When purchasing your carrier oils they should be cold pressed so that the essential fatty acids, vitamins and minerals are not destroyed. How do I know how much of these oils to mix together? Below gives a starting point to begin at. Always start on lower side with the essential oils until you know how your skin reacts to certain oils and then adjust as necessary. (Some essential oils can be more powerful than others. The following are the most common and most beneficial to your skin's health. Apricot Kernal Oil Good for all skin types and known for it's ability to penetrate skin. It is high in Vitamin E and rich in essential fatty acids which helps retain elasticity and soften skin. It has a light texture and is well suited for mature skin. Avacdo Oil Contains high amounts of Vitamins B1, B2, Vitamin A, Vitamin D and Vitamin E. It is also high in essential fatty acids. It is a superior moisturizer and significantly increases the production of collagen. It is excellent for dry, damaged and aging skin. It can also help in the treatment of eczema and psoriasis. Avocado oil is quite thick and rich so it can be mixed with a much lighter carrier oil. Coconut Oil / Fractionated Coconut oil is used often in skin care products not only because it smells so good, but also because it encourages healthy skin. It helps retain moisture and smoothes skin. it also has antibacterial and antiviral properties and can speed healing. Cranberry Seed Oil This is an extremely effective moisturizer. It is rich in Vitamin E and other antioxidants and has a significant amount of Vitamin A making it ideal for acne prone skin. It provides some protection from the sun and is also good for rough, dry and mature skin. Emu Oil Emu oil is very effective inflammatory, healing excelerant and offers a great deal of protection from harsh weather. It has a complete source of essential fatty acids and can penetrate through several layers of skin. It is a good treatment for age spots, dry skin, stretch marks, blemishes, eczema and psoriasis. Evening Primrose Oil This oil is a natural anti inflammatory and is high in antioxidants. Can reduce redness in skin and used for skin conditions such as eczema and psoriasis. Flax Seed Oil This is a very nourishing oil that is high in essential fatty acids. It seals moisture into skin, improves it's texture and lubricates and softens it. Flax seed oil can diminish the appearance of wrinkles making it ideal for mature skin. Grape Seed Oil Grape seed oil is excellent in skin care. It is high in essential fatty acids, vitamins and minerals. This light oil is good for all skin types, especially for skin types that don't absorb oils well. It aids in collagen production and keeps cell membranes healthy. Hazelnut Oil A very gentle oil that has natural astringent qualities, making it ideal for oily skin. it is hgh in Vitamin E, moisturizing and softening skin. Hemp Seed Oil This is a highly theraputic carrier oil. It has just about the perfect combination of essential fatty acids for our skin. It is a natural anti inflammatory and is extremely nourishing. Jojoba Oil Jojoba oil has absorption properties that are similar to our own skin's oil and has antibacterial qualities makingit a good choice for acne prone skin. Olive Oil Be sure to always use extra virgin olive oil. Olive oil is highly compatible with our skin and is an excellent moistirizer. It aids in skin cell regeneration, and cell membrane repair. Pomegranate Seed Oil This oil is very potent antioxidant. It promotes healthy skin regeneration, is very nourishing, deeply moisturizes and improves skin elasticity. It is very beneficial for eczema, sunburn, dry or cracked and mature skin. Sesame Oil This is a heavier oil that provides protection for skin. It's very rich in essential fatty acids and can be helpful for eczema and psoriasis. Sunflower Oil Sunflower oil is deeply nourishing with high amounts of Vitamin A, D and E. It easily absorbed and helps skin regeneration which makes it good for damaged skin. It is also good for treating dry and mature skin. Wheat Germ Oil This oil is rich in Vitamin A, D, E, B1, B2, B3, B6, essential fatty acids and minerals. It is also an antioxidant and has regenerative properties. Wheat Germ Oil is good for the treatment of dry, cracked skin, eczema, psoriasis, stretch marks and aging skin. Match one of these oils up with you favorite essential oil or include them in your skin care recipes. They will have your skin healthy, glowing, and yes, naturally beautiful! Naturally Skinsational Recipe Book is perfect for anyone looking to save money on skincare. There are 135 inexpensive and easy to make recipes that require ingredients that you probably already have in your kitchen. Recipes for every skin type!